← April in Florence 2012 – an outstanding fund raising event for cancer research! The Bucks County Chapter of Fox Chase Cancer Center hosted April In Florence on Saturday, April 14, 2012. Sponsored by Lauren and Don Morel and the Bucks County Herald, this year’s event returned to the opulent Keenan Motors Mercedes-Benz facility in Doylestown. This Italian themed event was another unforgettable evening of dining and entertainment that featured the delicious cuisine of the Waterwheel in Doylestown, cocktail music by Bucky Clark, and featured vocalist Lynell Antonelli accompanied by Bob Egan. Louis E. Della Penna remarked, “Instead of our annual trip to Italy this year, my wife Carol and I stayed in Doylestown as Fox Chase Cancer Center kicked off this spring with April In Florence”. All proceeds from this event, including those from the live and silent auctions as well as the special pledge, directly support research with the goal of one day rendering every cancer curable. The Bucks County Chapter of the Fox Chase Board of Associates was established in 1983 as a non-profit organization devoted to raising funds for cancer research and prevention for FoxChaseCancerCenter. This year’s special pledge featured Dr. Igor Astsaturov, a rising star at Fox Chase who is pioneering the personalized treatment of cancer. Dr. Astsaturov stated that, “we are now entering a new era in patient care, when each patient will be treated as an individual. Sequencing the DNA of each person’s cancer will enable us to understand what makes that person’s cancer behave differently, and provide a personalized treatment that is more effective and less toxic.” Dr. Astsaturov’s work is already paying dividends in that there are two patients, Chris Kalargheros and Barry Dixon, who would not be alive today were it not for the new treatment strategies resulting from his research. These patients attended April In Florence to give personal accounts of how Dr. Astsaturov’s new approach to cancer research and treatment has saved their lives. 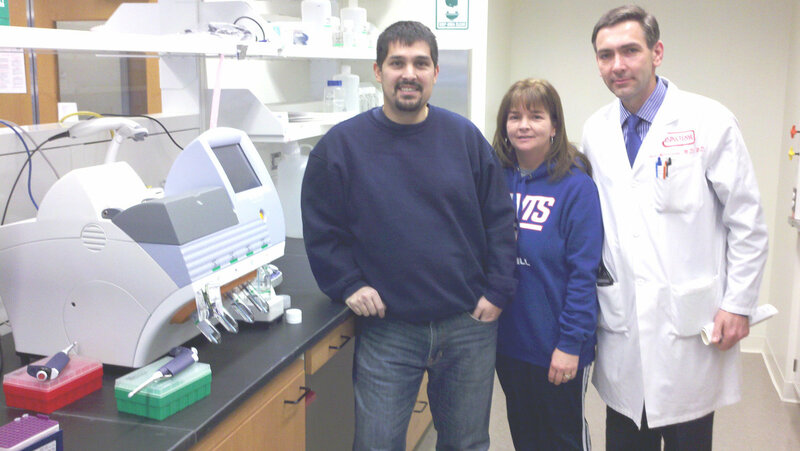 Chris and Jacki Kalargheros are pictured with Dr. Astsaturov (right) at the Fox Chase Cancer Center Cancer Genome Institute. Fox Chase Cancer Center is one of the few Centers in the nation in the process of developing cancer genome sequencing as a tool to tailor treatments to individual patients. The Genome Sequence Analyzer is pictured on the left. April in Florence committee members include Sara Moyer, Lillian O’Connor, Georgia Ford, Carole Barocca, Patty Ogiony, Robin Wiest, Judy Langan and Dan Levin. FoxChaseCancerCenterwas among the first institutions to be designated a NationalCancerInstituteComprehensiveCancerCenterand is one of the leading cancer research and treatment centers in the United States. Fox Chase researchers have been awarded two Nobel Prizes and their physicians are routinely recognized in national rankings. Today, Fox Chase conducts a broad array of nationally competitive basic, translational, and clinical research, with special programs in cancer prevention, detection, survivorship, and community outreach. For more information, visit Fox Chase’s Web site at www.fccc.eduor call 1-888-FOX CHASE or (1-888-369-2427).